Simple and easy tools to discover insights. For your qualitative research projects, brainstormings, ideation. Includes text-based focus groups, boards, blogs and other modules. Chat-based rooms with moderators, respondents and clients. Whiteboard module for presenting video or pictures, moderator’s guide, hidden answers and many other features. Let your participants write their own blogs and share comments with other respondents. Usage of pictures or video clips available. Invite people to discuss in bulletin board if it is not possible to reach all participants at the same time. 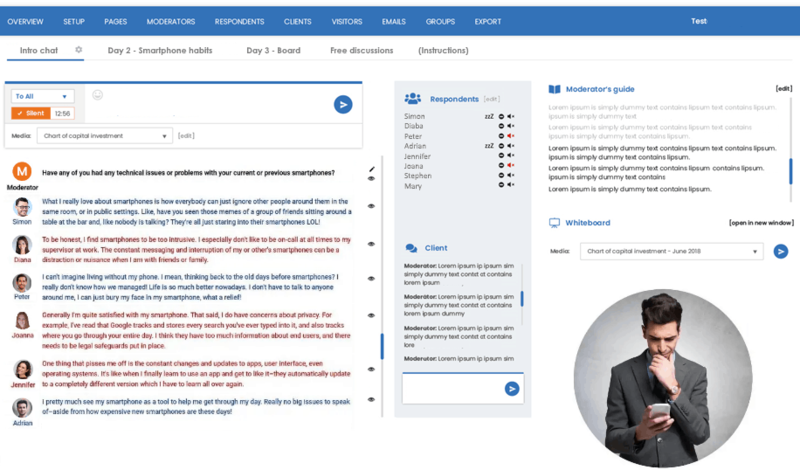 Simple and user-friendly administration of your qualitative online research. Setup of your project takes only a few minutes. Trusted by research companies worldwide. You can try and launch your project immediately. Want to check if Collabito suits your needs? Sign up for the free trial account. 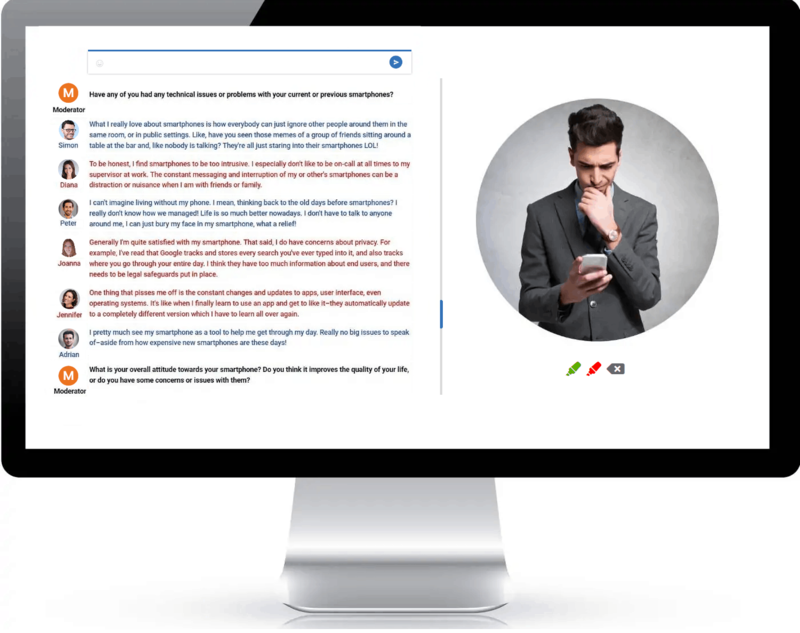 Building your qualitative online research project has never been so easy. Lay your qualitative project from different parts. You can conduct only one focus group or build a complex project with many blogs, discussion boards and chat rooms. It depends only on your needs. Each module is represented by one tab in the respondent’s panel. Each tab is independent from others and you can activate them separately. Respondents can interact with moderator and each other. 6-12 participants per one chat session is recommended. Respondents can see each other and talk to other participants. Moderator leads the discussion, communicates with respondents or clients. Clients can observe the moderator-respondents communication (like behind the one-way mirror), but cannot write messages to respondents. Observers are able only to watch the focus group, they cannot write any messages. Media presentation – show videos, pictures or YouTube streams on the whiteboard. Respondents can draw on the images. Moderator’s guide – prepare your questions in advance. To activate the question, just click and it appears in the chat box. Whiteboard – a big space on the respondents screen is dedicated to media presentation. Silent mode – you can switch the view of respondents so they can only see their own communication with moderator. Whispering – message are sent directly to another user. User info – see respondents information easily by moving mouse over its name. Export – real-time transcripts including whiteboard activities. Moderator submit tasks for participants. System support unlimited number of tasks/research themes within one project. Respondents write blogs according to the given tasks. Their blogs are visible to other respondents in the project. Other respondents can submit comments and discuss the topics. 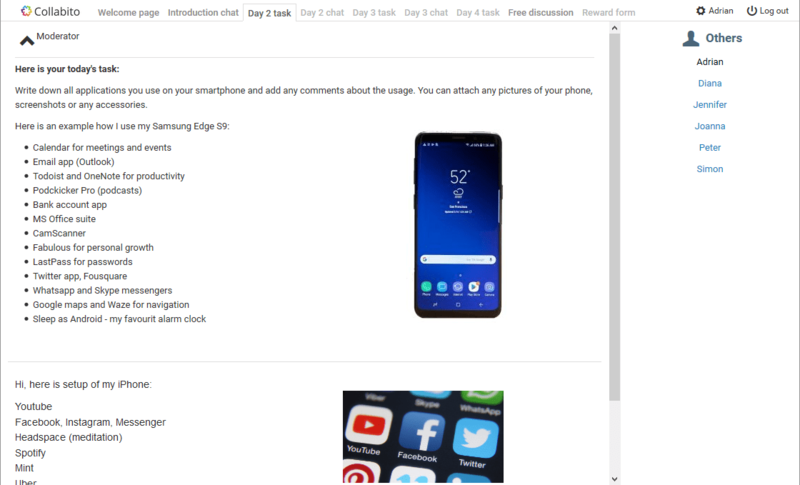 Collabito supports an easy application of multimedia – pictures, videos, sounds. Email invitations and reminders available.